There’s a lot to like about the 2017-18 Calgary Flames roster, but there are also a few pieces that just don’t quite fit the puzzle anymore. Players like Mike Smith, Johnny Gaudreau, Sean Monahan, and T.J. Brodie have been great, and obviously aren’t going anywhere. Michael Ferland and Sam Bennett have undoubtedly struggled to start the year, but should improve as the year goes on. Then there are three players who just don’t fit anymore. All three aren’t necessarily playing poorly, but their roster spots could certainly be better utilized. The most obvious, yet also the most difficult to trade is Troy Brouwer. He was brought in prior to the 2016-17 season to hopefully fill the void left by the departure of Jiri Hudler. It’s safe to say he hasn’t accomplished that. At this point I'd rather Mike Smith handle the puck than Troy Brouwer. There’s one big roadblock when it comes to trading Brouwer, and that’s his contract. He’s currently in his second year of a four-year contract paying him $4.5 million per year, which includes a no-trade clause. Given his production last season and even so far this season, there may not be many teams willing to take the risk. Last year, he totalled just 25 points (13 goals, 12 assists) in 74 games, his lowest point total of his NHL career. At 32 years old, his best days are likely behind him, but the veteran may just need a change of scenery to find the game that saw him post back-to-back 43-point seasons just three years ago with the Washington Capitals. If the Flames can find a trade partner that thinks they can provide that much-needed change for Brouwer, they need to pull the trigger. The return on such a trade certainly wouldn’t be glamorous, but the $4.5 million in yearly salary gained back would be. Those dollars could then be used in acquiring a superior replacement. Two players that fit the bill, and that could be on the trade market due to the unlikelihood of being re-signed by their respective teams are Patric Hornqvist of the Pittsburgh Penguins and David Perron of the Vegas Golden Knights. 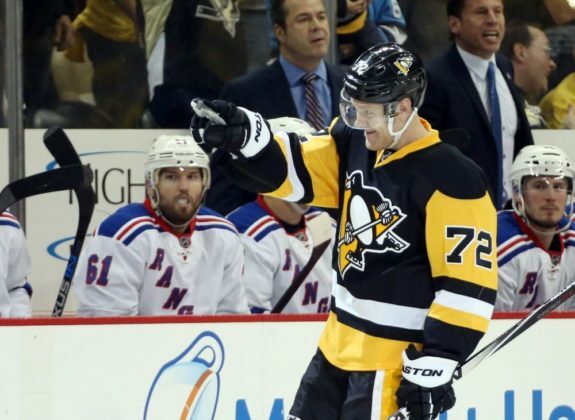 Hornqvist, 30, is in the final year of his contract, earning $4.25 million. In his last five seasons, he has surpassed the 50-point mark in all but one season. With Penguins forwards Bryan Rust and Jake Guentzel having hefty raises coming in the next couple years, it’s unlikely Hornqvist re-signs in Pittsburgh. Perron, 29, is playing on a one-year contract worth $3.75 million, and, given the number of players the Golden Knights will have to re-sign, it’s unlikely Perron will be there next year. Last year was his first full season played since 2013-14 due to bad luck with injuries, and he really showed what he’s capable of when healthy, posting 46 points (18 goals, 28 assists) with the St. Louis Blues. Both players would have a lower salary cap hit than Brouwer, but would provide the top line right winger the Flames have been seeking. Other than the start to this season, Matt Stajan has been good for the Flames. He’s been a great penalty killer, solid in the face-off circle, and is well-liked by teammates and fans. He will become an unrestricted free agent after this season, so it’s worth it for the Flames to see what they can get for him, rather than lose him for nothing in free agency. The reward for moving Stajan won’t come from the return in the trade, but from who replaces him on the roster. Mark Jankowski has been a center in the Flames system since 2012 and would be a massive upgrade, in almost every category, over Stajan. After a stellar 2017-18 preseason, it seemed like his time to join the big club had come. But, to the surprise of many, he was assigned to Stockton prior to the start of the regular season. The 23-year-old continued his fine play from preseason into the AHL season where he’s tallied eight points (five goals, three assists) in six games. With the Flames current lines, trading Stajan would open up the fourth-line center spot. But Jankowski doesn’t belong there. In order for the Flames to get the maximum production out of him, he needs to play on the third line. That would require current third-line center Sam Bennett to move to the wing, which has proven to be a better fit for him, and Freddie Hamilton and Curtis Lazar sharing the fourth line center duties. 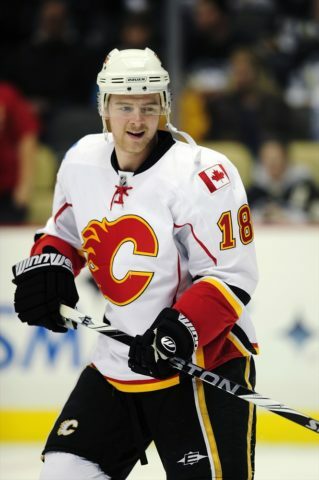 Stajan will be a great fit on another team, just as he was for the majority of his Flames career. But, right now, he’s occupying a roster spot that can be better utilized by a younger, bigger, stronger, and more talented player. Related: Can Jankowski Ignite the Flames? 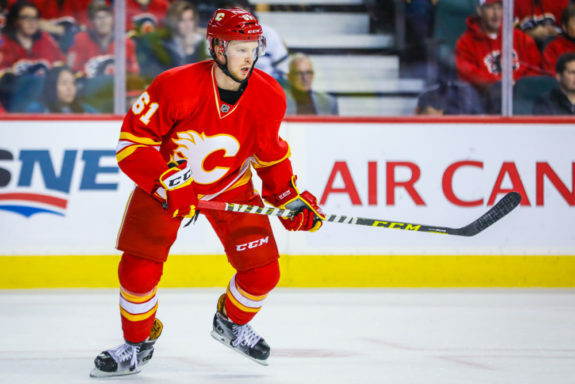 Why trade Brett Kulak instead of Matt Bartkowski? No team will trade for Bartkowski. Kulak, on the other hand, is a young, promising defenseman that a lot of teams would be interested in. He’s not going to light up the scoreboard, with only three points in 31 games with the Flames, but he almost always makes the smart, simple play, and is solid defensively. Although it may seem odd to trade a talented, young defenseman who’s shown he can play in the NHL, the multiple young defensemen playing in Stockton with even more potential than Kulak make it a logical move. The likes of Rasmus Andersson, Oliver Kylington, and Josh Healey have all shown plenty of promise, with Andersson leading the way. There’s also 2017 first-round pick Juuso Valimaki who surprised everyone with his play during training camp and preseason. He’s likely still a few years away from cracking the Flames roster, but is still yet another strong talent. Barring any setbacks or struggles, Andersson should be ready for the NHL by next season, which means a roster spot will need to be vacated. Although Kulak may be a better defenseman than Bartkowski in the long run, the potential return on a trade favors Kulak for that same reason.